As Australia unveils its new 21st century pavilion this year, many other national pavilions within the Venice Biennale’s Giardini are being ‘veiled.’ The pavilions of Canada, Israel, Austria and Greece are actively disguised or altered by their artists. Others are swamped with liquid, or littered with broken glass, in each case drawing our attention to the building’s architecture, the function and politics of the Giardini allocations or even the limitations of possessing these much sought after permanent national pavilions. The artist collective BGL hides the Canadian pavilion under scaffolding, transforming the building’s entrance into a tiny corner store. From the scaffolding, we are invited to drop coins through a maze into the glass windows. These windows—an important element of the Archimedean spiral-inspired structure—no longer function as the building’s exterior, but rather as an element of play within. Similarly, Israel’s Tsibi Geva drapes their pavilion under a grid of more than a thousand tyres—a coating that evokes danger in both sight and smell. Leaving the exterior untouched, Austria’s Heimo Zobernig transforms his national pavilion’s distinctive arches and multi-level floor into a pared-back space. The 1930s building was designed by Joseph Hoffman and Robert Kramreiter, and is celebrated for its innovations in early Modernist gallery design. One of the key practical design characteristics is the diffused natural light source, which Zobernig has blocked with a low black ceiling and coupled with an equally oppressive floor. We are denied all reference to the already relatively minimal interior. Without the few distinctive features, we focus on the empty space and, amusingly, the expressions of the confused visitors who wander around the building looking for the artwork. It’s a very different experience to the narrow maze-like structure built by Austria’s 2011 representative, Markus Schinwald. Like Zobernig, he viewed the high ceiling, central raised entrance and long split interior as problematic, installing white painted ply to block both the ceiling and exterior approach. The notion that their building is ‘difficult’ to work with seems to be fairly consistent across many of the pavilions and, paradoxically, these ‘problems’ have inspired some engaging installations in response. Opposite Austria’s pavilion is Greece’s equally symmetrical, but more decorative building. Its patterned exposed-brick exterior, portico and marble columns stand in contrast to the grimy recreation of a leather workshop within. Maria Papadimitriou’s installation is a replica of a shop in the Greek city of Volos, the celebratory exterior enhancing the impact of the raw and chaotic interior. 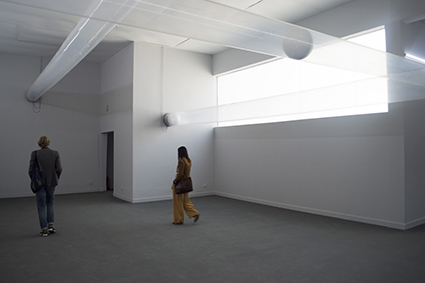 It works in a similar way to Mike Nelson’s 2011 immersive environment within the Neo-Palladian British Pavilion, the interior of which he also referred to as ‘difficult.’ His aim was to “displace the viewer to another place,” and like Papadimitriou’s installation, the building’s romantic exterior acted as an important foil to the dark labyrinthine construction within. Some of the more aggressive interactions with these buildings could be considered negative, but perhaps they simply communicate underlying cultural anxieties. The pavilions carry societal baggage—both positive and negative—having been designed or adapted according to the fashions, values and aspirations of the day. The USA’s 1930 Neo-Palladian building, for instance, reflects a certain cultural conservatism, while the redesign of the Greek and German pavilions in the same period contain nationalistic themes in line with their politics. Australia’s former pavilion (architect Philip Cox, 1988) with its humble curved corrugated iron roof and wooden deck, was distinctly Australian. Its replacement (Denton Corker Marshall, 2015)—a mysterious solid black cubic structure that stands apart from its neighbours—is indicative of the image Australia now wants to project. The original was always described as temporary; however, the majority of the buildings within the Giardini were built in the spirit of impermanence and it’s only in the last 20 or so years that the buildings have remained fairly static. Those built in the early 20th century included apses and columns to accommodate sculptures, just as the architects of the new Australian pavilion have created a white cube in the name of ‘neutrality.’ The simple flat-walled interior definitely gives the illusion of a blank slate—a very literal response to the constant criticism of the old pavilion’s ‘difficult’ two-tiered space, which in itself inspired a work by Daniel von Sturmer in the 2007 Biennale. For the new pavilion’s inaugural exhibition, Fiona Hall has darkened the walls, using vitrines and spotlights akin to the aesthetics of a natural history museum. There are no stairs to get in the way; no marble columns or apses carrying cultural baggage; no courtyards or pesky internal tree trunks, though these distinctive features have over the years inspired engaging and critical artistic responses. There are 30 permanent national pavilions within the main Giardini site, while 30 countries have temporary ‘pavilions’ at the biennale’s other key site, the Arsenale. The remaining 31 have established temporary exhibition spaces around the city in palaces, shop fronts and churches. The allocation of permanent Giardini space is undeniably political. The first pavilions were allocated to colonial powers like Belgium in the early 20th century, and today, the list of represented countries largely mirrors real life global power. A site within the Giardini carries prestige, a guaranteed audience and in the opening three days it is the first place the media flocks to. But for countries without these sought-after sites, the opportunity to choose a location can be used strategically; New Zealand’s artists, for example, have consistently demonstrated the benefits of working outside these permanent spaces. New Zealand is a relative newcomer to the Venice Biennale, participating for the first time in 2001. 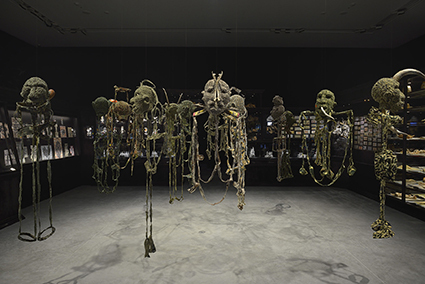 While many countries excluded from the Giardini set up pavilions in the snaking Arsenale warehouse, the sites chosen by New Zealand in recent years have either been specific to the artwork or used to enhance elements in it. Michael Parekowhai’s 2011 contribution and Francis Upritchard’s 2009 work used elements of their grand surroundings strategically and sympathetically. Upritchard’s petite figures, for instance, were installed in the rooms of an ornate neo-classical palace. Placed on simple tables, some of the colourful human figures gazed into the room’s cloudy mirrors, but were not site-specific per se. They were sensitive to their surroundings, and in turn, the environment subtly altered and enhanced the artist’s work. This year’s representative, Simon Denny, uses multiple sites, one old and one new: the ornate Renaissance-era Marciana Library in Piazza San Marco and the arrivals area at Marco Polo Airport. Secret Power is inspired by Edward Snowden’s top-secret USA intelligence leaks, exploring power relations in an age of global telecommunications. 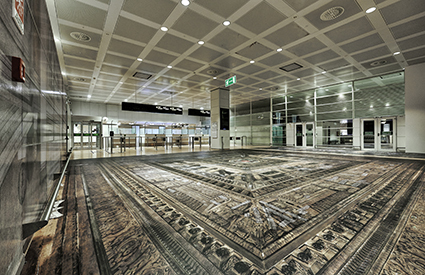 Photos of the library’s celebrated interior are plastered on the floor, walls and luggage carousels in the airport’s secure arrival zone. Even though I’m aware of the installation beforehand, I walk past the decoration without thinking because in an age of visual communication and marketing, I have learned to block out advertising strategies that use this kind of pictorial language. In a way, my unconscious dismissal indicates the work’s success, particularly as Denny’s installation in the library interrogates the way in which visual communication and play can be used to conceal knowledge and influence unconscious behaviour. As Denny’s site-specific artwork demonstrates, for countries excluded from the Giardini ‘club,’ Venice provides a rich source of sites for critical engagement. However, no country would give up a spot in the Giardini. The location brings much-desired media attention and a guaranteed audience, which, in an art world dominated by marketing and hype, trumps ease and flexibility of site every time. The inflexibility and ‘difficult’ spaces consistently cited by artists working within the Giardini, is not necessarily a negative; after all, these loaded spaces have inspired some of the most interesting artworks of this year’s biennale. The Giardini’s history is fascinating; not only does it map a century of cultural and political power, it has also survived fascism and contains an unparalleled mix of architectural styles that trace the aspirations of countries over time. Difficult or not, it’s a site that begs for artistic response.